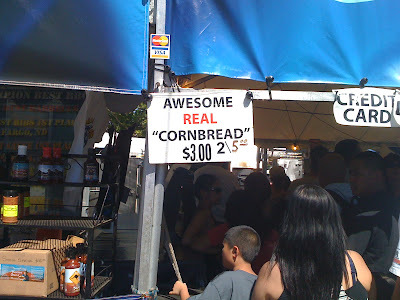 The “Blog” of “Unnecessary” Quotation Marks: real "cornbread"
They're selling real SOMETHING. What it is, I'm not sure. Just bread? Thanks, Melody. If it's awesome, it can't be mere cornbread. I'm guessing there's a drug in it.